I purchased the factory accessory saddlebag kit and the rear frame carrier. When looking through the instructions, the sidebag brackets use two factory mounting points under the frame. The rear carrier uses four, but also uses two of the same holes for the sidebag brackets. Sigh. I assume it's one choice or the other or has anyone made this work? If I had the choice, I want to keep the sidebags and just return the rear carrier. The rear factory frame carrier also weighs a ton. Anyone know of options for a rear frame carrier that will work with the Yamaha sidebag brackets? I may be misunderstanding this or not visualizing this properly, but couldn't you just purchase longer bolts and mount the sidebags over the bracket for the rear carrier? I had a hell of a time putting on the panniers rack rail system without the rear rack. Apparently this will NOT mount up unless you have the rear rack on it. I did not want the rear rack just the panniers. So I solved my forward mounting issue by going to the hardware store and buying a solid rubber 1 1/4 round tapered stopper. I drilled in the center and shaved a tad off the length and it looks and works great. I know this does not solve your problem but it give's you options. Also there is no info on this mounting instructions anywhere maybe it may help someone. I mounted up the Sidebag racks. No way will this thing will fit between the mounts. I'll take some pictures of it so it makes more sense. Lol, the Yoshi fender eliminator looks good but the stock turn signals hit the Panniers. I bought the rear plate tidy tail and returned it. Your right no way this fits with the stock turn signals. So I kept the standard stock plate and turn signals because I wanted the pannier system more. 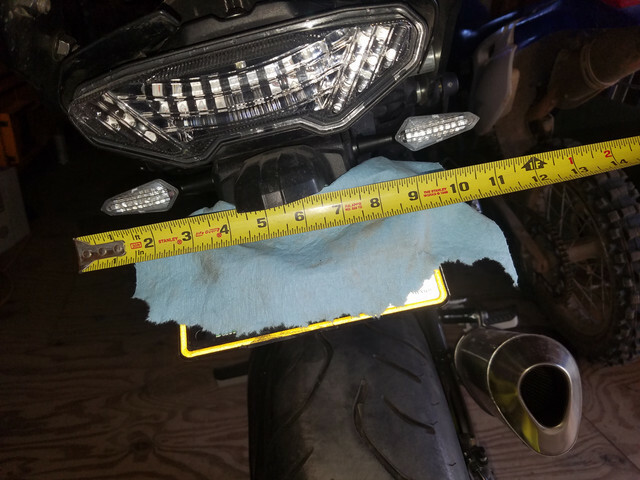 In Massachusetts you must have 9" between the turn signals or you won't get a sticker and would a ticket/fine if caught on the road. Just can't do it. My Vagabond tail tidy (and most others I've seen) have basically the same turn-signal separation as stock (definitely a lot more than 9"). But the issue is they're much closer to the taillight, 'encroaching' on the space needed even for small bags, like the SW Motech Blazes I was considering. Fortunately, I just wanted to get a pair of bags in case I ever needed them, but no way that trumps having to put back (which I threw away) the stock abomination of a tail, so will just live with my trusty Ogio tail bag. The only other way to circumvent that is to install those flush signals. No way I'd do that for my own safety, even with incurable cancer, but to each his own . I installed CNC racing jet turn signals to have room for the bags with the vagabond Tail today. I couldn't get a straight angle for the photo. It's 11" outside to outside of the signals and right at 7" between the lenses. This setup gives me clearance for the SW Motech bags.